All You Need This Spring Carnival! Neds Toolbox – Your Punting Toolbox For Spring Racing! Neds members can enjoy refunds and stakes of up to $500 when they utilise any of the tools in the Neds Punters Toolbox, while a max bet of $1000 can be placed with Price Boost. A detailed preview of each product in your Neds Toolbox can be seen below, including function and application can be found below. The Neds Punters Toolbox includes everything you’ll need for the ultimate racing betting experience this Spring Carnival! 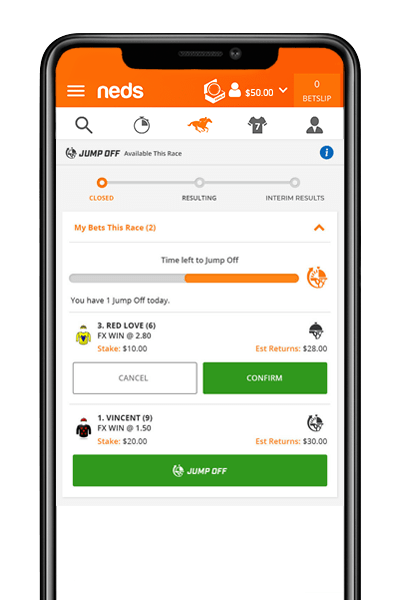 The Neds Jump Off product allows punters to cancel their single fixed-odds win bet on any eligible Australian or New Zealand thoroughbred race, after the race has started. If you don’t think your horse is going to win, simply Jump Off your bet before the timer ends! 1) Navigate To Race Field and Expand ‘My Bets This Race’ – If you’ve placed a bet on an eligible race, the ‘Jump Off’ Icon will appear above the main field in the ‘My Bets This Race’ module. Click ‘My Bets This Race’ to view the bets you can Jump Off. 2) Once Your Race Begins, The Jump Off Timer Starts – As soon as your chosen race has started, the timer will begin and the ‘Jump Off’ button will appear below each eligible bet that you have placed. 3) It’s Time To Jump Off – Click the Jump Off button designated to the eligible bet of your choice. Select ‘Confirm’ and you have successfully Jumped Off. 4) You Jumped Off, Bet Stake Returned – You have jumped off your bet and your full stake will be returned as soon as the race result is settled. 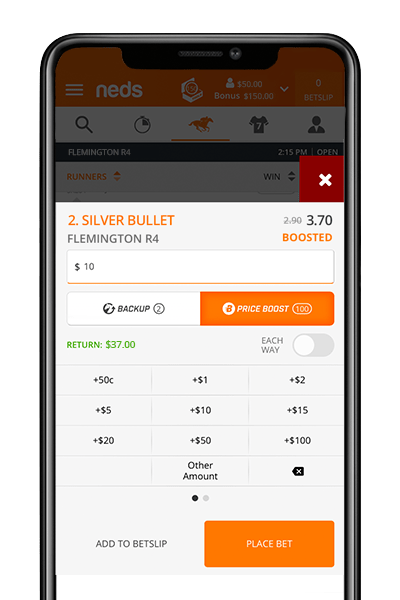 The Neds Backup product allows punters to select a second runner as extra insurance to their fixed-odds win bet on any eligible Australian or New Zealand thoroughbred race. Back one horse and select a second as your Backup, and if your original bet finishes second to your Backup runner, you’ll receive your stake back up to $500. 1. Place Your Fix Win Bet With Quick Slip Or Bet Slip – Select the runner that you would like to back and enter your stake into the bet slip, as per usual. 2. Select Your Backup Runner, Choose Wisely – Click the ‘Back Up’ button located towards the top of your bet slip and select the runner that you would like as your Backup. 3. Back Up Selected, Bet Ready To Be Placed With A Second Chance – With your Backup runner selected, it’s now time to confirm your bet. Click the Place Bet button at the bottom of your bet slip. 4. Keep An Eye One Your Backup Bet In Pending Bets And Bet Statement – Your Backup runner will appear in blue below your first selection, in your list of pending bets and your bet statement. The Neds Fluc Up product allows punters to take advantage of an increased fluctuation in the market, after they have placed a bet on an eligible Australian or New Zealand thoroughbred race. If the fixed odds drift after your bet is placed, Fluc Up can be used to lock in the next highest quote. 1. Place Your Fixed Win Bet, You Have 5 Minutes To Fluc Up Your Odds – After backing your runner, navigate to your pending bets. You will have 5 minutes to Fluc Up your potential windfall. 2. Select Fluc Up, Lock In Higher Odds – Expand the Fluc Up module on your eligible racing bet and the inflated price will be displayed. Click the Fluc Up button once more to confirm. 3. See Your Fluc’d Up Odds In Your Pending Bets – Your Fluc Up is now confirmed and your increased odds will be visible in your pending bets. The Neds Price Boost product allows punters to take advantage of an inflated quote on any fixed-odds runner of their choosing, on eligible races. 1. Add a runner to your bet slip. 2. Click the Price Boost button and see the price increase. 3. Input your staking amount and place your bet (Max bet $1,000). 4. Check the bet slip is correct and confirm your bet. So there you have it, Neds Toolbox is everything that you need to make the most of your Spring Carnival racing betting experience. Join Neds below to get started! trained by the Bjorn Baker stable. BRIGHT RUBICK IS ON DEBUT HERE IN THE GR3 GIMCRACK STAKES FOR THE 2YO FILLIES. SHE WAS AN EYE CATCHING 2ND IN A RANDWICK 852M BARRIER TRIAL ON THE OFFICIAL 2YO TRIAL DAY, THE 17TH OF SEPTEMBER AT ROYAL RANDWICK. SHE JUMPED WELL BUT DRIFTED BACK TO LAST IN THE HEAT. TYE ANGLAND WHO RODE HER IN THE TRIAL & STICKS WITH HER HERE (POSITIVE SIGN FOR A TOP JOCKEY), TOOK AN INSIDE RUN (WHICH IS ALWAYS GOOD TO SEE A YOUNG HORSE ABLE/WILLING TO DO) AND DESPITE ANGLAND NOT FLINCHING A MUSCLE ON HER IN THE STRAIGHT, SHE RAN HOME IN THE FASTEST 600M SECTIONAL OF THE ENTIRE DAY. THE OVERALL TIME OF 49.37 FOR THE 852M WAS THE FASTEST FILLIES HEAT OF THE DAY & 2ND FASTEST OVERALL (ONLY NARROWLY BEHIND EXCEED THE STARS WHO WON HEAT 1 & IS FAVOURITE FOR THE COLTS & GELDINGS 2YO RACE SATURDAY, THE BREEDERS PLATE). SHE CRUISED TO THE LINE TO FINISH 2ND BEATEN JUST 1.5L BEHIND WHAT LOOKS LIKE A SPEEDY SQUIB IN SYLVIA’S MEMORY, BUT ABOUT 100M PAST THE POST SHE WAS A LENGTH OR 2 IN FRONT OF THE PACK. THAT REALLY SAYS TO ME SHE’LL RELISH THE 1000M ON DEBUT. STUART RAMSAY A MULTIPLE GR1 WINNING OWNER HAS A BIG OPINION OF HIS FILLY AS DOES TRAINER BJORN BAKER WHO RATES HER THE BEST 2YO HE’S EVER TRAINED, EVEN BETTER THAN HIS MAGIC MILLIONS WINNER OF 2014 UNECUMBERED. THAT’S A BIG WRAP. SHE’S DRAWN PERFECTLY TO SETTLE JUST BEHIND WHAT WIL BE A HOT SPEED UNDOUBTEDLY & WILL GET THE RUN OF THE RACE. ANGLAND WILL JUST HAVE TO FIND THE GAP & ONCE HE DOES HE’LL PUSH THE GO BUTTON & SHOW THE EXPLOSIVE TURN OF FOOT BAKER HAS REPORTED & WE SAW A GLIMPSE OF IN HER TRIAL. VERY EXCITING FILLY, THERE WASN’T ANY OTHER STANDOUTS FROM THE TRIALS SHE’S UP AGAINST, SO IT’LL TAKE ON OUT OF THE BOX OR PLAIN BAD LUCK TO BEAT HER. GREAT BET AT $6.00 & $2.25!!! AT THOSE ODDS YOU CAN HAVE AN EACH WAY BET AN INSURANCE IN CASE SOMETHING COMES FROM LEFT FIELD AND STILL SHOW A NICE PROFIT IF SHE DOESN’T WIN BUT RUNS A PLACE……BUT TRAINER, JOCKEY & CONNECTIONS ARE EXPECTING HER TO SALUTE THE JUDGE FIRST!